Before sound can float within your listening space, it must first float through the space within your audio cables. And that space is known as the dielectric. The quality of the dielectric is defined by a number, 1 being the best. Air has a dielectric constant of 1. This is important, because the closer we can get to air, the less colored the sound will be. Dielectrics all posses a quality known as dielectric absorption. Dielectric absorption is proportionally related to the dielectric constant and acts like a distributed capacitor that charges and discharges energy randomly as the signal passes through the cable. Some say this effect can cause a loss of fine detail. And if that is true, then we have an obligation to address it. It gives the listener peace of mind; and in hi end audio, that is often just as important as getting it right technically. We call our new premium cable "Spiral Air" because the conductors are sandwiched between a thick layer of air filled cotton and the shield is a unique spiral design. Cotton has a dielectric constant of just 1.3 2/ and that's nearly perfect. Naturally, the center conductors are Litz construction. Litz construction provides the most perfect path for AC signals, everyone knows that. But the big news in our cable is the Litz Reussen spiraling shield. This lets us exploit the simplest of cable constructions: the coaxial design. Most cable companies abandoned the coaxial design in exchange for twisted dual center conductors and a directional shield. Some even abandoned the shield altogether. But there is a way to combine both of these concepts into one better, simpler design. The better solution is found by winding a Litz shield around the center conductor. In this way the 2 conductors always pass at right angles while retaining the shielding so important for noise rejection, especially in phono connections. And since braiding is a standard cabling process, we can easily braid 2 layers of air filled cotton 2/ between the two conductors. Thus escaping the cost of more expensive and exotic constructions. This new high performance cable is quite flexible and light as a feather. It is often said that simpler is better, and making a great cable should be no exception. I believe we have found that better way with the KAB SpiralAir interconnects. Oh, and did I mention, one pair weighs just 3 ounces! Lastly, let's talk about connectors. There is a lot of concern these days about brass. However most connectors use brass typically with a gold over nickel plating to enhance conductivity. KAB offers all of it's cables with a good quality brass and Teflon connector. However, I also recognize the concern for an all copper signal path, and that is why we also offer our cables terminated with ETI Bullet Gold over Tellurium copper connectors. the ETI connectors are very well accepted and have passed the test of time for a well designed all copper connector. Order 3 Ft KAB SpiralAir Interconnects/ETI Below. More sizes are listed on the Litz Cable Page. Weight per pair 3 Oz with ETI connectors. By using 2 thick layers of braided cotton, our SpiralAir cable achieves a dielectric constant of 1.3. 2/ Air, with a DC of 1, is considered the best you can do. Proving that you can get mighty close to perfection at a price most everyone can afford. 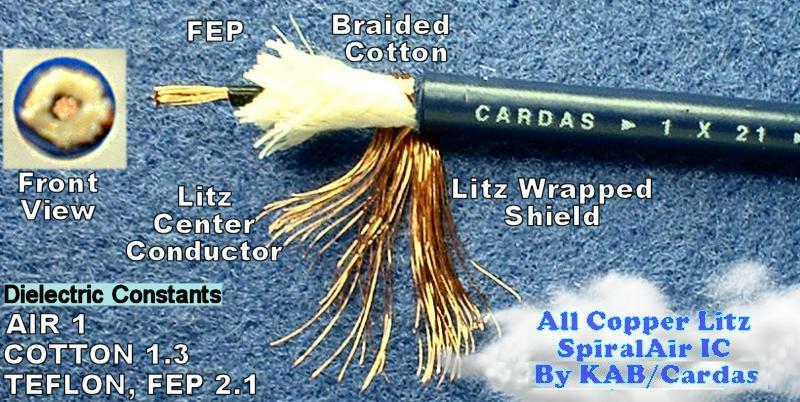 By using Litz conductors in the center and in the shield, we achieve the simplest cable design possible. The strands must be wound a specific way to equalize velocity in both directions, but we leave that know how to Cardas. But as you will learn if you keep reading, velocity plays only a small role in audio cable design. But spiraling the shield, now that is pure genius as it eliminates any possibility of proximity effect. I think most other cable makers out there avoid litz in the shield because, to be perfectly honest, its not easy to work with. It requires special handling and takes a bit longer to assemble. But the results are completely worth it. And hopefully, I have made it easy to understand why. Did I mention that a 20khz wave is nearly 50,000 Ft long? And a 20hz wave is 1000 time longer. Give that some thought, and then think about what is really going on in just 3 ft of wire! Dielectric absorption is the name given to the effect by which a capacitor, that has been charged for a long time, discharges only incompletely when briefly discharged. Some believe that cable capacitance can contribute this effect to the passing audio signal causing coloration and loss of fine detail at low levels. The lower the dielectric constant, the smaller this phenomenon is. I believe that the most neutral sound will come from pure copper. This makes sense if you understand skin effect. The skin effect describes how higher frequencies currents tend to crowd into the outer edges of the conductor. If you plate the copper, you introduce skin effects that affect the treble quality. Tin plate will lose detail, Silver plate will enhance detail. Our general recommendation is not to use plating in wires that are not easily removed. And to not use plated conductors at all if you are interested in neutral reproduction. Speed of Light = 3E8 m/s that's 300,000,000 meters per second. Prop delay is simply the speed at which an alternating current travels down a wire. If the send and return wires are floating in air, the speed is 3E8 m/s divided by 1 the dielectric constant of air. For Teflon the speed down the wire would be 3E8m/s divided by 2.1 or 1.42E8 m/s. For KAB SpiralAir Interconnects the speed is 3E8 m/s divided by 1.3 or 2.3E8 m/s. So for pure specmanship, our cable is 65% faster than Teflon and only 24% shy of light speed. But does this delay translate into something sonically significant? I don't think so and heres why. A 20Khz wave traveling at 2.3E8 m/s needs 37,375 ft of wire for just 1 wave or cycle to exist on the cable. So, in 1 meter of cable, the actual time delay is 1/2.3e8 or just 4.35 nano seconds! An infinitely small amount of time compared to our audio range. So while it is good engineering to optimize all these parameters, It's nice to know that with KAB SpiralAir cables, you can get very close without paying a kings ransom for it.